After the most recent reports from the automobile industry, we can conclude that pickup truck from Hyundai in not anymore a matter of speculation yet the question now is when the model will be officially announced. 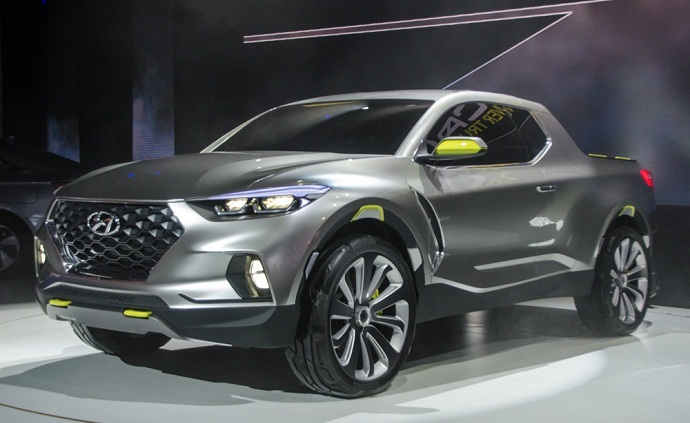 After Hyundai presented its futuristic Hyundai Santa Cruz concept model at the 2015 Detroit show, this pickup track vision was well-received by the truck-hungry audience and the green light for the production version has been given. In that context, president of Hyundai Motors Amerika, Mr. Dave Zuchowski confirmed that decision for the production has been made but we should expect an announcement in the next period as well. The new member of the pickup truck segment will arrive sometime in 2018. The 2019 Hyundai Santa Cruz will compete with the unibody Honda Ridgeline. We don’t know much about design and styling of the 2019 Hyundai Santa Cruz as the prototype hasn’t been caught on the roads and Hyundai also hides details about this project. However, what we should expect is that mentioned concept model will jump to production without of major changes. What, actually we won’t see on the production version is the rear half-door design which will get the full-size form for the version of this lifestyle pickup truck we would ride. The production version will also have the overall silhouette of the concept model but will lose some futuristic concept’s details. Expect to see more production-like grille and headlights version similar as on Hyundai’s latest vehicles and toned-down body sculpting. On the other hand, this mid-size truck is expected to be based on the unibody platform of the Tucson crossover. That means this truck, like the Pilot-based Ridgeline, would be capable of delivering almost car-like driving and interior comfort. It will also offer more practical and larger cargo capacity than SUVs. As for the interior, we should also expect it to adopt the design similar as on Hyundai’s crossover models. It will also get brand’s latest infotainment system and should also feature some of advanced safety systems. What engine options will be available with the 2019 Hyundai Santa Cruz and other powertrain hardware are not known at this moment. The production version will likely be available with the petrol and turbodiesel engines. The possible candidate for the engine option is the four-cylinder turbodiesel engine which will power some of the Genesis-badged models. The model will, on the other hand, come with front- and all-wheel drive. An automatic transmission system would likely get a manual alternative. The unibody platform and crossover like suspension system will provide more refined ride quality while will lose some of the off-road and towing capability compared to body-on-frame compact trucks. The 2019 Hyundai Santa Cruz will likely make its debut late this year at the Los Angeles Auto Show. It could also arrive at the next year Detroit Show. The production could take place in the Montgomery plant. The first estimations regarding its price suggesting the starting point from around $25,000. The sales should start in the last quarter of 2018.